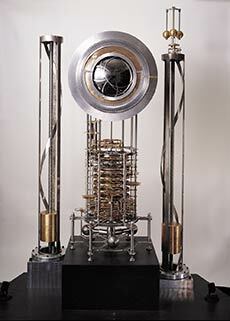 This past Thursday night I listened to Alexander Rose talk about the Long Now Foundation’s 10,000 Year Clock project. I have to admit the project didn’t make much sense to me when I first heard about it. I thought the project was a bit crazy and way too ambitously misguided and impractical. But nonetheless I was curious to see why some of the world’s most profound thinkers would spend time, money and their resources to think about and construct such a clock. And as I listened to Rose talk more about the inspiration of the project and I read what Wired wrote about it, things started to make a bit more sense. I started to see why this project is important for live music fans. I started to make connections to our concert experiences. I started to think… long-term about concert fans stories. What is The Long Now Mission? Yes, that’s a pretty radical mission considering the speed at which our world moves and how obsessed we are with short-term thinking, especially the concert industry. But as Rose continued to explain how they’ve begun to construct the 10,000 clock in West Texas, I was quickly reminded why I started Live Fix. And the more I thought about it, one of the biggest emotional connections I have to live music and sharing concert fan stories is really rooted in long-term thinking. Because when I first started Live Fix my goal was not to just tell what was going on in the present, but I wanted to celebrate and understand how the collective emotional history of our concert experiences impacts our now and in the future. And when I thought back to why I wrote about my Dad’s passing last August, I was reminded again why long-term thinking and consistently telling concert fan stories is so important. It’s important because I believe that even if nobody reads Live Fix and I get no (short-term) web traffic, RTs or Facebook “Likes,” I’m still successfully chronicling my concert experiences so future generations, and possibly my kids, will know what concerts meant to me and how they changed my life, and how they can change their life too. When I look back at my relationship with my Dad and I continue to understand who he was, I know for a fact that seeing Neil Diamond live changed his life. But I wish I knew more about the details of that experience and how that night forever changed and emotionally-altered the coarse of his life. And it’s that long-view look at my Dad’s life, is one of the main reasons that has lead me to want to tell the stories of how my experiences have directly impacted my life and the lives of my fellow concert fans. I’m passionate about this long-term mission because I know that there’s an immense amount of value in chronicling my concert experiences, and the experiences of other dad’s, concert fans and artists in this way, because when future generations read those stories they will begin to understand the bigger picture. And by doing so, future generations will hopefully understand that the concert experience wasn’t just a hedonistic escape of pleasure, but it had a deeply profound and eternal emotional impact on our lives. And I know that this kind of thinking is definitely long-term, because it’s clearly is contrast to most of the music blogging world. Don’t get me wrong I love my fellow music blogger. But to be honest, many of them are way unfortunately and sadly way too short-term focused. And I won’t go into that because the reason for this addiction to short-term thinking is a topic we’ll discuss later in other posts. I’ll wrap up this post with a contrasting moment of clarity I had as I walked out of the Museum of Contemporary Art and took a stroll along Michigan Avenue. 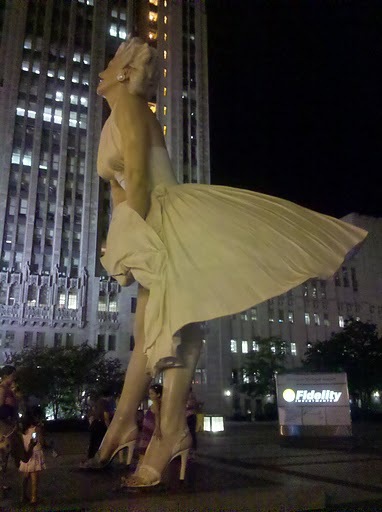 A few blocks down I encountered the new Marilyn Monroe “Seven Year Itch” statue that is by the Tribune Building. And as I stood and marvled at the for awhile — like all the other awe-filled onlookers who where taking photos while they hugged Marilyn’s plaster legs — I realized how profoundly different my reaction to this Monroe statue was to my reaction to the 10,000 year clock. And I also thought how, during his talk, Rose said that throughout human civilization, from the stone age to the digital age, icons, monuments and statues have always played a major role in helping to communicate big ideas and represent myths or abstract concepts. And these historical markings and iconic benchmarks not only help us to get a grasp on the big concepts in the present, but they also tell future generations what was important to us as a culture and what they should think about as their culture develops. That said, I was amazed at the fact at how Marilyn Monroe statue and the 10,000 year clock evoked such different reactions in me because of their contrasting purposes. I’m not entirely sure what the purpose of having this Marilyn Monroe statue is, but I know that it doesn’t provoke or encourage me to think long-term. If anything, it sends us backwards to get drunk on the past and descend into an abyss of nostalgia. All this considered, I’m still continuing to make sense of the 10,000 Year Clock, but I do believe we as concert fans need to think more in the long-term when it comes to our concert experiences. to push this conversation forward. So let me know what you think and continue to explore this topic on a future episode of Live Fix Radio. How should long-term thinking influence your concert experiences? Do you chronicle your concert experiences with a 10,000 Year Clock mindset? If concert fans got together to construct our own metaphorical monument, what would it be? What would it look like? How hard would it be for for us to create a physical monument that got us thinking about the long-term impact of our own concert experiences? Could we create something that would have deep meaning and significance, or would we create something as nostalgic and short-term thinking as the Marilyn Monroe statue?